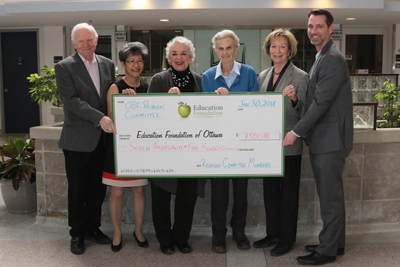 A cheque for $7,500 was donated to the Ottawa Education Foundation for the Marjorie Loughrey Artists in the Schools Program. This represented the profits from our 2017 Reunion. Shown in the photo from left to right: Murray Sands, Bonnie Cheung, Elda Allan, Jane Dobell, Mary Lou Fleming, Chris McGarvey. Thanks to all who attended and supported this very worthy cause! Over 220 former OBE staff members gathered for an evening of entertainment and reminiscing on September 23rd, almost twenty years after the dissolution of the Ottawa Board of Education. The organizing committee, once again led by Bonnie Cheung, had a wonderful time planning the reunion and we hope all who attended enjoyed themselves as well. Every reunion has a theme: "Memory Lane", "The Way We Were", or "Remember When" as examples. The 2017 OBE Reunion was based on the theme, "The Way We REALLY Were." The program presented us with some little known stories of our board. The video shown that evening was another highly entertaining production by Steve Moretti and Pat Holloway. Marc Moretti took individual pictures of the reunion attendees which have been included in this slideshow . Instructions for how to download full resolution images suitable for printing are found here. The one and the only, "The Rolling Bones" (Sylvia Darwood, Yvonne Navratil, Susan Scott and Barbara Clark), made a special appearance and performed to a very appreciative audience. If you missed it, here's a video of the performance. The profits from the 50/50 draw and the silent auction will be donated to the Marjorie Loughrey Artists in the Schools Program. The special live auction item of the iconic Pierre/Justin Trudeau photo sold for $1350 and the silent auction was once again very successful in raising money for the program. Hawthorne is a small (247) students JK-8 school with students families from over 40 countries. 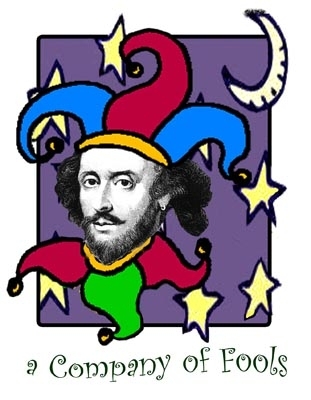 With the $2000 bursary, Hawthorne hosted A Company of Fools (Introduction to Masks Performance) for the week of February 27 to March 3, 2017. All grades participated and all students received at least one half day session with the artists. Students had the opportunity to learn the origins of masks, their uses in different cultures and in theatre. Students were able to touch and try on masks. They then used their imagination and expressiveness by playacting/role playing as animals and trees. The presenter also touched on mask making and types of materials used. This event was a very positive experience for the students who do not always have the opportunity to attend theatre or artistic events. Hawthorne staff and students are very appreciative of the funding from your association that allowed us to do this. "We all got to try on masks and played a play and it was so fun!" (Grade 4 student). "The masks had great features and made you feel like anyone you want to be" (Grade 8 student). Thank you so much for the grant we received from you for this school year, 2015-2016. It was greatly appreciated by the students. 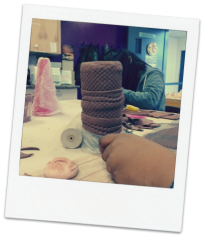 They made social, emotional, confidence-building and skill-based gains throughout the year, by participating in multiple pottery sessions (hand-building and the wheel). In our first session, one student, Jason, refused to participate. He was so afraid of failing that he just sat in one spot, disengaged. Yolanda, our key instructor, placed a piece of clay near him. At the very end of the session, he poked at the clay. 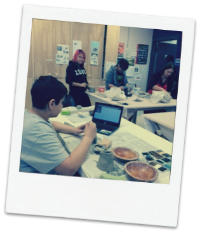 By the end of the year, through the various classes, Jason was molding and working with the clay, taking positive risks. 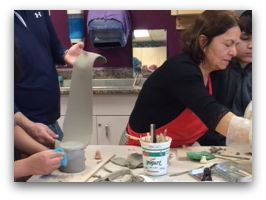 He used the wheel, enjoyed glazing, and became comfortable in the pottery studio, accepting that pieces did not have to be “perfect”. This speaks to the success of working with clay, to become open to taking positive risks. 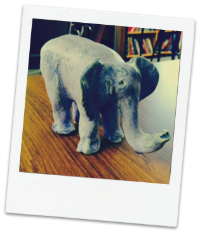 Another student, Jordyn, found that the process of working with clay eased her anxiety. She spoke of loving the studio experience numerous times to her parents, such that they are now looking for a Summer course for her. She is now becoming more engaged in her local community. All students looked forward to their time in the studio. The opportunity to take risks in an accepting environment, with Art as the focus, was not only a time for developing skills, but a time to build community within our group. It was observed that students became supportive of one another, rather than critical. The students began to take greater risks as they progressed. They also had an opportunity to develop healthy social interactions. With increased confidence and trusting peer relations, students became more actively engaged with learning that took place not only in the studio, but in the classroom. In terms of the focal point of the project, we ended up hand-building rectangular window planters instead of the original vases and bowls. After planting seeds, and discussing the care that plants require in order for them to grow and develop, the students were disappointed to discover that their seeds did not thrive. They coped with this, partly due to the resiliency they developed in the pottery studio, and problem-solved. 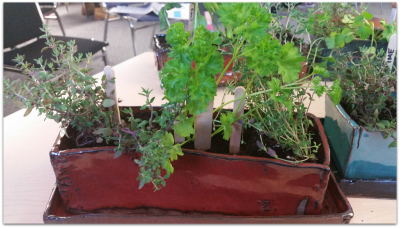 In a recent classroom discussion, the students shared how their plants were surviving. They were able to celebrate success. More to the point, circle discussion then progressed to talking about the care that students need, in order to thrive in their own worlds, especially when confronted with challenges. 200 former OBE staff members gathered for an evening of entertainment and reminiscing almost eighteen years after the dissolution of the Ottawa Board of Education. The organizing committee, so capably led by Bonnie Cheung, had a wonderful time planning the reunion and we hope all who attended enjoyed themselves. Phrases heard often that evening were: "Remember when...."; "Seems like only yesterday..."; and "I can't believe it has been that long!" The program brought us all back to the special events we witnessed and participated in as employees of the best board in Ontario. The video shown that evening, produced by Steve Moretti and Pat Holloway, reminded us of the many happy times we enjoyed back then as residents of the "kingdom called OBELand". Paul Shuster captured some of the sights and sounds from the reunion in this slideshow which includes a clip of our own talented "Tragically Hip Replacements" and their musical interlude based on the Sound of Music. Paul also took individual pictures of the reunion attendees which you can see in this slideshow. Slideshow of Photos taken by Paul Shuster of all of the attendees. Instructions on how to adjust the settings on the slideshow and save high resolution images for printing. Over 230 employees of the former Ottawa Board of Education gathered for a reunion on Saturday, September 28th at Algonquin College.The following video was part of the entertainment and brought fond memories of a time gone by. Well done Steve Moretti and Pat Holloway - it was one of the highlights of a very memorable evening. A cheque for $ 4,000 was donated to the Ottawa Education Foundation Marjorie Loughrey Artists in the Schools Program specifically, to be disbursed to fund programs for inner-city schools. This represented the profits from our 2013 Reunion. 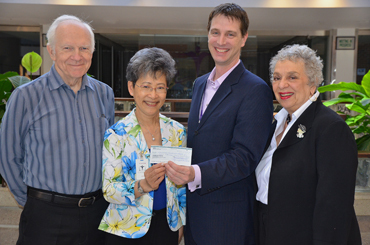 Shown in the photo from left to right: Murray Sands, Bonnie Cheung, Chris McGarvey and Elda Allan. The Marjorie Loughrey Grant Selection Panel received eight applications for the 2014-15 school year, three from inner-city schools. • $2,000 from the 2013 OBE reunion donation was granted to Pinecrest PS, for a dance project, called “A Journey through the Decades”. • This project meets the criteria established by the selection panel, the needs of the students and fits well into curriculum guidelines. • The project focuses on Dance, and offers a one-week residency to the students from grades 1-8. The organization, Luv2Groove, consists of 2 dancers who provide dance workshops. • 300 students at Pinecrest will have the opportunity to learn different styles of dances from the 70s, up until the dances of today. The following slideshow contains pictures and quotes from staff and students on the Luv2Groove project at Pinecrest. The Selection Panel will use the remaining $ 2,000 for the following year. A letter acknowledging receipt of this donation was received from Chris McGarvey, Executive Director of the Education Foundation. Our 2010 donation funded a visual arts project at Regina Street P.S. and a dance project at Arch Street P.S. Approximately 380 K-6 students benefited from these projects. Over 350 staff members of the former Ottawa Board of Education gathered at Algonquin College for a marvellous buffet supper, and to rekindle old friendships on October 2nd for our second reunion. The net proceeds of over $3500 from the Silent Auction and 50/50 draw will be donated to the The Marjorie Loughrey Artists in Elementary Schools Award. If you weren't able to make it, the following 13 minute video will give you a taste of the fun we had and the games we played. How many of these smiling faces do you remember from the OBE? Our talented Programme Committee entertained us with a challenging game of OBE Jeopardy. For those who could not make it to the reunion, you can play along by following the links below. Test your memory. See how many you can get right.